Our daily living environments are affected in many ways by the constant flow of wind. Many different aspects in life are closely related to airflow, including improvements in urban climate, developments in renewable energy, crisis management in relation to the risk of outward flow of fire or gas, and the like. With the development of increasingly more powerful computer systems in recent years, it has become easier for people to analyze the invisible flow of air through the use of simulation and visualization technology. Nowadays, this method of analysis has become much easier to implement when compared to running actual experiments using physical wind tunnels. Airflow Analyst® is a piece of software that uses GIS (Geographical Information System) and spatial data to simulate the complex airflow movements that take place within the space that surrounds us. An analyst can specify an area on the map to be analyzed, and the software then reproduces and represents wind movements across the surrounding terrains and buildings. Some people may feel concerned that these analyses may be difficult to understand unless they are fluid dynamics experts. However, you can rest assured that this is not the case. Using a generic PC and intuitive operations, you can reproduce complex airflow movements with a high level of accuracy. Airflow Analyst® is a tool especially created for planning officials to allow them to create the most optimal designs. The software uses a fluid dynamics algorithm ?a core element for the provision of highly accurate airflow analyses? based on the RC-GIS calculation program, which was developed and tested at Kyushu University. 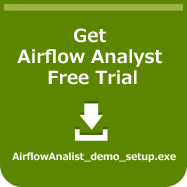 Airflow Analyst® is a third-party extension software of the world renowned “ArcGIS for Desktop” product, supplied by the GIS software company ESRI. Please evaluate most advanced wind simulator on GIS. The latest version Airflow Analyst Ver.1.5 has been released. Airflow Analyst Ver.1.4 is released!